More and more couples are choosing to get married abroad. Whether it’s a chateau in the south of France, a glittering snow topped mountain in the Alps or on the white sandy beaches of the Bahamas… There is so much of the world to choose from. So I have put together some tips and thoughts to keep in mind when planning your wedding abroad. A wedding is the biggest and most expensive party you will ever throw; it’s a celebration of the start of your married life together – so why not do it in the sunshine? This was exactly my thoughts when my partner finally popped the question! My chosen destination was Malta. This small country off the coast of Italy has always been close to my heart, most of my childhood memories are here holidaying with my grandparents. After doing a bit of research it ticked every box for us, beautiful churches, scenic views and fantastic hotels that cater to all. In the early stages of my wedding panning, I identified four main points that were imperative to making the trip a success: Weather, Travel, Language and Local Laws. 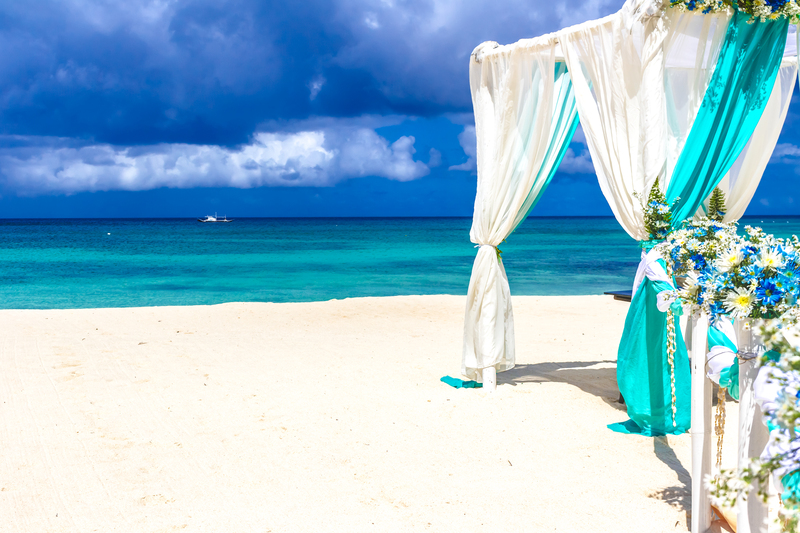 Weather is main reason couples choose to get married abroad and should be considered carefully when planning your wedding. Don’t underestimate the heat – Many people make the mistake of organising the ceremony during the hottest part of the day, exchanging your vows with melting make up and sweaty suits under the beating sun is not pretty! Equally with cold countries, make sure the venue has sufficient heating and have a few fur throws to hand just in case. As much as you would hope to never need it – be sure to have a ‘wet weather plan’. Even in hot countries there are still rainy days, so make sure you have something in place just in case the heavens open. This may involve another space in the venue or a simple marquee to cover an outside space. Quirky ideas for favours that could help with these issues are: Fans to keep cool or umbrellas to keep your guests dry. It’s important to remember that this is a holiday too for your guests, be sure to give enough time and information to help them plan and budget their trip. Send save the dates between 18 months and year in advance of the wedding date to allow everyone the chance to book time off work and let them plan their year with your wedding in mind. Including an information pack with your invite is always a good idea. Include information about local hotels to meet every budget and the nearest airport. 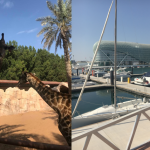 As well as a useful local guide with things to do and see, and timings for the day itself, so that everyone has the chance to squeeze in any sightseeing and exploring! Guests are likely to fly out at least a day in advance and leave the day after, so we found it worked well to organise a few activities to keep everyone entertained and together, such as a relaxed cocktail reception the night before, followed by a chilled brunch the morning after. This gives everyone a chance to catch up and reminisce before heading back home. Venues/Hotels will have English speaking staff; however it is useful to get to grips with the local language, particularly when dealing with specific planning details. Many outside suppliers, cake makers and florists will be natives and English may not be their first language. For contracts and legal documents, I would advise having them professionally translated before signing, just to be on the safe side. As useful as Google translate is for deciphering e-mails, its best to have a fluent speaker look over any documents, as some phrases may not translate directly, and could have significant meaning. Before booking your venue check the marriage laws for UK residents in your chosen country, as this may influence your decision. Some countries will only issue a marriage licence if you have lived in the country for a certain amount of time, whereas others may require you have the legal ceremony in a local Town Hall. It is often the case that couples will legally be married a few days in advance, and then have a symbolic ceremony on the actual Wedding day which is held in the same venue as the reception, and can be as elaborate or relaxed as you choose. For example Malta require you to be in the country for a minimum of 2 days prior to the ceremony, so we had to works our plans and flights around our chosen date of marriage. If you are taking out high value items such as the all-important wedding rings, check that your travel insurance will cover you for these. There are also courier services that specialise specifically in transporting high value items, so it might be worth looking into one of these if you have a number of expensive/sentimental items to take out with you. Are you currently planning your wedding abroad or even your dream honeymoon? Get in touch with myself or one of the travel specialists at Jigsaw Travel and we can help you plan the perfect big day with a personal touch!